Why Certify and Collect U.S. Mint Sets? What does the black OSV Sticker mean? Many sets in today’s marketplace have had one or more coins removed and replaced, thus making the sets less valuable. The regular black lettered sticker attests to the fact that each board is indeed original and guaranteed as such by OSV. What does the blue OSV Sticker mean? This sticker attests to the exceptional overall beauty of the board relative to other boards of that same date and mint. These boards are the finest in eye appeal for the date. Want to purchase certified OSV sets? Click here to find a certified OSV dealer near you. The story of Double Mint Sets is fascinating. The Treasury did not, all of a sudden, decide to start issuing sets for collectors in 1947. In reality, too many dealers in the late 30's were ordering rolls for store stock. As a result, the Treasury announced they would limit orders to "two of each denomination from each mint". The Treasury Department began to issue single Mint Sets in 1959 and continued through 1964. After a little over a decade of issuing Double Mint Sets, the Treasury were able to greatly reduce the costs of production as well as the work load for their department by issuing only one of each coin and house them in clear plastic holders. 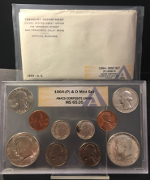 This new type of packaging allowed the collector to view both the obverse and reverse of the coins without having to remove them. 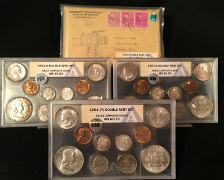 The ANACS Double Mint Set Registry will be available soon. Find out statistics on OSV certified sets. How many are graded and how many? Find out here. Find our how to submit your sets directly to OSV.